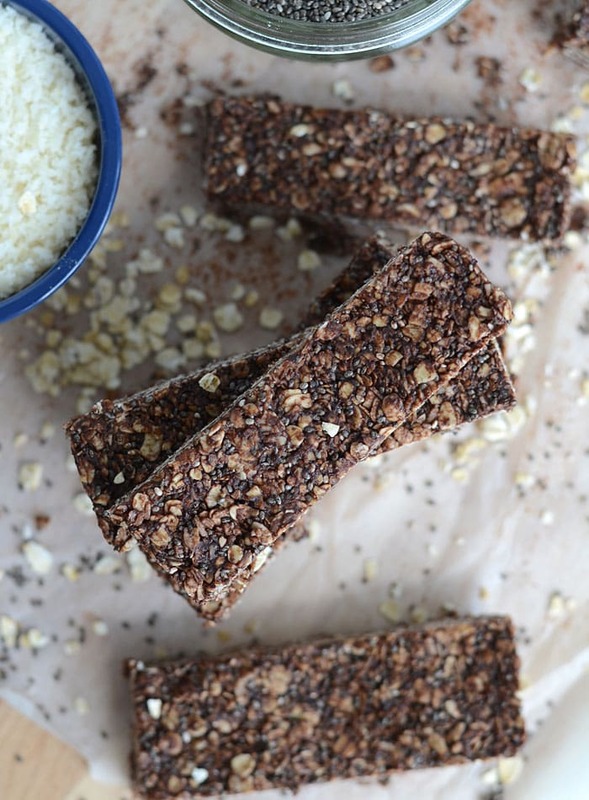 It’s been a while since I shared a no-bake bar recipe so let’s bring ’em back with these chocolate coconut chia seed bars! These bars are super easy to make, you only need a few ingredients and there is no baking or blending required. 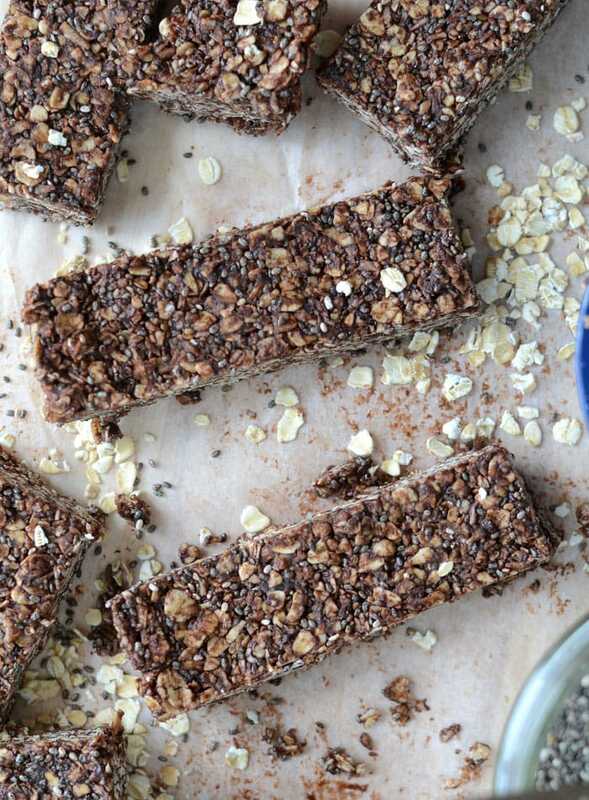 Having a batch of these bars tucked away in the fridge or freezer will keep cravings at bay and provide a boost of all-natural energy and nutrition whenever you need it. Chia seeds are one of my favourite ingredients. I love making chia pudding, adding them to oats, smoothies and baking and using them in all sorts of snack recipes! 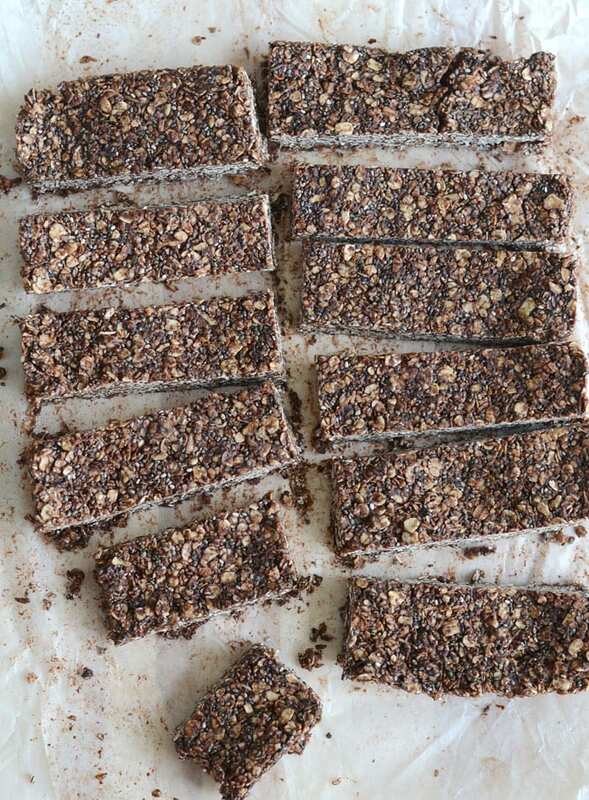 Basically, if there was an example of true superfood, chia seeds would be it and what better way to use them in these easy, no-bake bars! COCOA POWDER OR RAW CACAO POWDER? Raw cacao is made by cold-pressing unroasted cocoa beans whereas cocoa powder has been roasted at high-temperatures. Unfortunately, roasting cacao at high-temperatures greatly lowers the nutritional value so to reap the amazing health benefits of chocolate, it’s cacao powder that that you’re after. When you read about how good chocolate is for you, we’re talking raw cacao, not your average store-bought chocolate bar. The typical grocery store chocolate bar has been so heavily processed that by time it reaches the shelf, it no longer offers the nutritional benefits of cacao. I use both cacao powder and cocoa powder in my kitchen buy I try to use cacao more often. It’s the obvious choice but it is more expensive. Use it in place of cocoa powder when you can but no worries, raw cacao powder and cocoa powder can be used interchangeably in recipes. 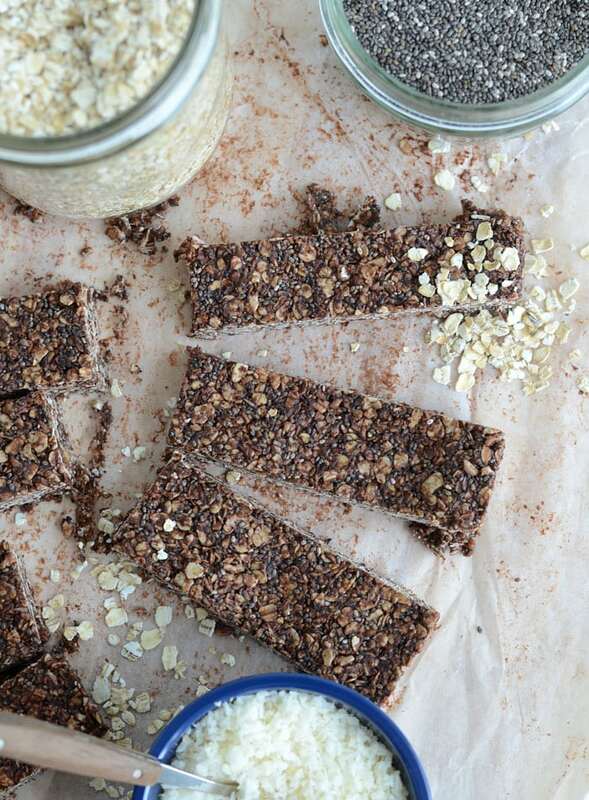 Make sure you’re using natural peanut butter in these bars and not processed peanut butter. Processed peanut butters have added hydrogenated oils (trans fats) and sugar and have a completely different consistency than natural peanut butter. When you bring home natural peanut butter, the oil will have most likely separated and risen to the top of the jar. I recommend storing it upside down before opening to help mix the oil back in. I store my natural peanut butter in the fridge, upside down and once it’s been mixed, it stays mixed this way. When purchasing natural peanut butter, look for brands that contain either just peanuts or peanuts and salt. 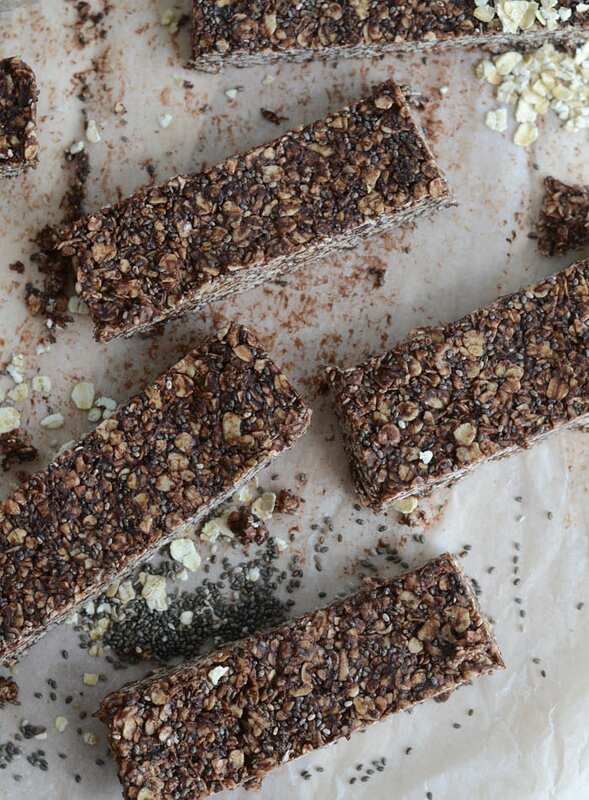 In addition to chia seeds, these delicious bars also contain oats, coconut and peanut butter, all which contribute their share of carbs, protein and fat to fuel your busiest days and of course, they all taste great! What’s not to love! In fact, I’m finding them a little addictive, so be careful, just sayin’. If you want to try more delicious and healthy chia seed bars, you’ve got to try my No-Bake Chocolate Chia Seed Energy Bars and my Chocolate Chip Chia Seed Bars. Both recipes are no-bake, vegan and gluten-free and taste AMAZING. Check them out! Melt the peanut butter, coconut oil and maple syrup together in a small bowl in the microwave or on the stovetop in a small saucepan. Whisk so it’s well combined. Add the wet mixture to the bowl of dry ingredients and mix to combine. Line a square baking pan with parchment paper then add the mixture. Press down firmly and thoroughly. Lift and cut into 10 bars. Please note these bars need to be kept in the fridge or freezer to hold together properly. These bars need to be kept in the freezer or fridge to hold together properly. FYI, they taste amazing pulled straight from the freezer! The salt is optional but recommend. I love the sweetness from the maple syrup combined with the sea salt. Tastes amazing! Guys, I really love to hear from you so if you make this recipe, please come back and leave me a comment with your feedback! 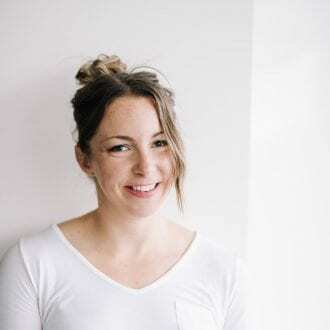 You can also connect on social media @runningonrealfood, it makes my day whenever every time someone tags me on Instagram with their version of one of my recipes. Thanks so much! Love, Deryn. This chocolate bars are nice & fav things to kids…. It would be delicious in my Gourmet Catering service in Mumbai… keep sharing more!!! 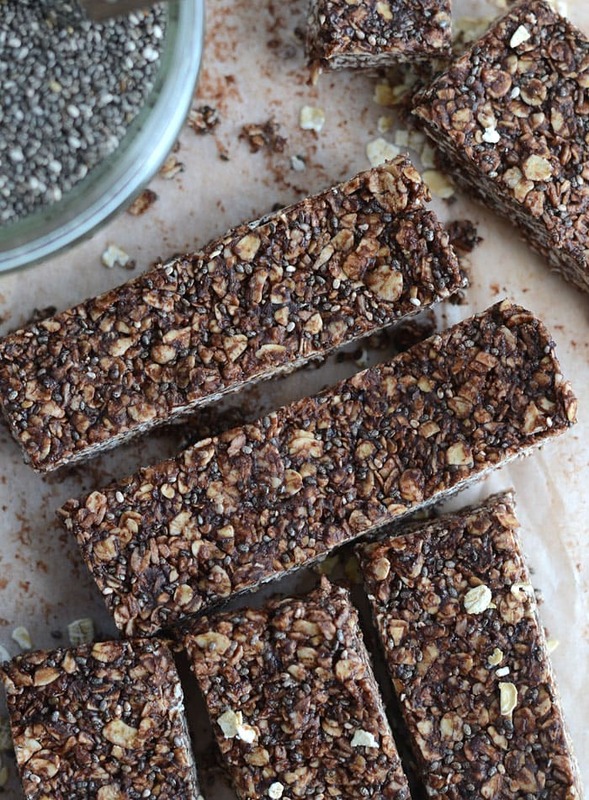 These bars would be an incredible post workout snack! Especially for a chocolate lover! Totally! They’re awesome post-workout. 🙂 Thanks for the comment! Could you use rolled oats instead of quick oats? I found rolled oats to be too large and the bars didn’t hold together very well…but you could try pulsing them in the blender first so they’re finer and I think that should work ok.
You could use sunflower seed butter or tahini. So delicious! I didn’t get all the “batter” in the pan because I was too busy eating it. I was a little worried the peanut butter flavor would be too heavy for my preferences, but it was perfect! I’ll be making theses regularly, no doubt. And they may be a new go-to for food gifts. Thanks for the tastiness! Cani i use esame seeds instead of peanut butter? I don’t have maple syrup on hand. Can I substitute honey instead? Yep, that should work ok.
Just made them today!!! Such a winner recipe! My 1 and 3 year old loved it and so did my husband who usually hates coconut (didn’t tell him there was any..!) will be making more! Just wish they hold together better and didn’t need refrigeration. You know I also thought of crumbling some over some yogourt.. yum! Ooh, ya, these are great crumbled over coconut yogurt! Yes, these ones do need refrigeration to hold together but there are some goods ones on the blog that don’t if you want to browse around 🙂 glad you and your family enjoyed them. Take a look through all my snack recipes, there are some good ones for sure! I like using a base of dates to help hold them together. Can you use less Maple Syrup or substitute it out for something else for a little bit less sugar? You could try reducing the syrup and adding more peanut butter and/or coconut oil then using some stevia or another sugar-free sweetened to sweeten the recipe if you want. I haven’t tried it with less syrup though, so I can’t guarantee results. These bars are fabulous! Thanks for sharing. Curious and I may have missed this information somewhere, but do you have the nutritional value of these yummy things…protein, calories etc? Thanks again! No need to reply…I found it. I need to look a little better. Again, these are delicious! I’m sorry I don’t have the nutritional values of these ones because I didn’t measure exact weights when I made them. I’ll have to make them again with more precise measurements to get the nutritional info but I’m not sure when that will be. In the meantime, if you make them, simple create a recipe in the MyFitnessPal app to get the nutritional info per bar. Thanks a lot! Just made them and they turned out brilliant! Just wondering if it would be possible to pre-soak the Chia so they’re not as crunchy? Or would this make the whole bar too wet? Ya, I don’t think soaking them would work for this bar, it would be too wet, like you said. You could probably used soaked chia if you adjusted the rest of the ingredients but it would be a whole different recipe. I kind of like the crunchy seeds in there 🙂 I’m glad you enjoyed them! i gotta ask…do these constipate you? Ive read that you should eat un-gelled chia sees sparingly because they will just soak up the water in your gut and just block you up! I LOVE the crunch of un-gelled chia seeds but don’t want to gum up the works! Is it necessary to use Himalayan salt? Or regular, locally produced salt is enough? No, it’s not necessary. Any sea salt will do, just not table salt. Heya! Just made these, awesome! They should be fine for a couple weeks in the fridge or a few months in the freezer. 🙂 Enjoy! Fabulous low-sugar treat, and high in omega-3! Love it! My granola bars melted even after they had set. They didn’t even last for 10 mins outside. What could the reason be and what can I do to bind it? Hi Gitika, please see the recipe notes: “These bars need to be kept in the freezer or fridge to hold together properly.” Because the coconut oil is one of the binders and it melts at room temp, these need to be kept cold. These are amazing!!! I added dried cranberries, pumpkin seeds and small chocolate chips (maybe a handful of each). This is my first time making granola bars and I don’t think I could ever buy them again. Thanks for this recipe. Thanks so much Diana, so glad you enjoyed them! Those add-ins sound amazing. Could coconut butter be used instead of coconut oil? As long as it’s melted and very drippy I think coconut butter should work. I haven’t tried it though so I can’t guarantee it!